Precious metals futures were mixed on Friday but they all ended lower than a week earlier. Gold and silver marked their first weekly declines in five weeks. Gold for April delivery on Friday added $4.50, or 0.4%, to settle at $1,230.80 an ounce on the Comex division of the New York Mercantile Exchange. "The fact that U.S. inflation rose gives the Fed more latitude for raising [interest rates], but I’d be amazed if they did, given the global headwinds and the degree of uncertainty about the global economy," MarketWatch quoted Mark O’Byrne, research director at Dublin-based metals broker GoldCore. U.S. consumer inflation was flat in January, the Labor Department said on Friday. That said, the CPI advanced 1.4% over the past 12 months for the fastest rate of inflation since October 2014, and it doubled December’s level. In addition, core consumer prices picked up 0.3% last month for their strongest advance since August 2011. For the week, gold prices slipped 0.7%. A week earlier in surging 7.1%, the yellow metal posted its best weekly increase in more than seven years. Gold is 16.1% higher on the year to date. 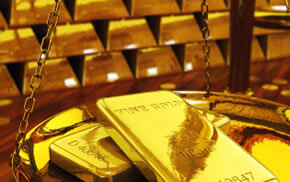 A majority of market analysts also expect gold prices to move higher in the near term. Out of 34 market experts contacted, 17 responded, of which 10, or 59%, said they expect to see higher prices next week. At the same time, four professionals, or 24%, said they see lower prices and three analysts, or 18%, are neutral on the market." Elsewhere on Friday, silver for March delivery shed 5.9 cents, or 0.4%, to settle at $15.373 an ounce. Silver prices declined 2.6% on the week, trimming their increase so far this year to 11.4%. Last week, the precious metal rallied 6.9%. April platinum was unchanged at $945.60 an ounce. It registered a 1.3% weekly loss. Palladium for March delivery fell $5.80, or 1.2%, to $499.05 an ounce, sliding 5.3% from a week ago. For the year to date, platinum has climbed 5.9% while palladium has plunged 11.2%. Gold added $21.05, or 1.7% to $1,231.15 an ounce. Silver added 12 cents, or 0.8%, to $15.37 an ounce. Platinum added $8, or 0.9%, to $941 an ounce. Palladium declined $6, or 1.2%, to $501 an ounce. For the week, losses totaled 0.7% for gold, 1.7% for silver, 1.7% for platinum and 4.8% for palladium. Gold coin sales advanced 28,500 ounces compared to last week’s 31,500 ounces. Sales splits include 22,000 ounces in American Gold Eagles versus 27,500 ounces previously and 6,500 ounces in American Gold Buffalo coins compared to 4,000 ounces previously. Silver coin sales moved up by 926,500 ounces after rising by 1.1 million ounces last week. Sales came entirely from American Silver Eagles. Last week, Silver Eagles advanced 1 million ounces and Shawnee National Forest Five Ounce Silver Bullion Coins rose by 100,000 ounces. The U.S. Mint is rationing weekly sales of American Silver Eagles because of silver planchet shortages. This week, the Mint allocated 1 million of them. Bullion distributors left 73,500 on the table, reflecting some easing in demand. The 2016 American Silver Eagle cumulative total stands at 8,926,500 coins since going on sale Jan. 11. Last year’s 2015-dated Silver Eagle ended at a record 47 million coins, with sales through Feb. 19, 2015 reaching 7,705,000 coins.